In compliance with the UAE Foreign Assistance Policy that steers exchange of knowledge and expertise, the 3-day event involved the participation of hospitality and Tourism trainers as well as experts from the Emirates Academy of Hospitality Management. The mode of delivery included case studies, best observed practices and scenarios while the topics of study included overview of the Kenyan hospitality and tourism sector, food and beverage, role of technology in hospitality sector, communication and marketing skills and women leadership in the hospitality and tourism sector. The program concluded with awarding of certificates to the participants at a colorful graduation ceremony presided over by Honorable Najib Balala, Cabinet Secretary of Tourism and Wildlife, the UAE ambassador to Kenya, His Excellency Khalid Khalifa Al Mu’alla and the CEO of Kenya Utalii College, Hashim Mohamed including other invited guests including ambassadors and government officials. 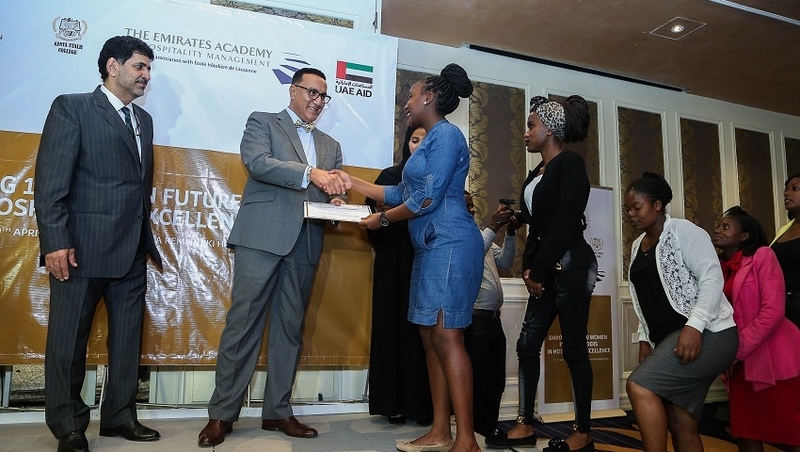 The UAE ambassador reiterated the important role played by Kenyan women in economic development of the country and noted that the training would go a long way in equipping the participants with relevant skills to excel in the hospitality and tourism industry. He went to state that the program was a reaffirmation of the UAE’s pledge towards the world through supporting research and development, training and education for achieving the sustainable development, with special focus on youth and women empowerment. He also said that women and girls’ empowerment ranks high among the priorities of the UAE’s Foreign Assistance Policy 2017-2021 and it’s also one of the strategic focus areas of the UAE Ministry of Foreign Affairs and International Cooperation. Towards this end, the UAE has committed $50 million to the World Bank’s ‘Women Entrepreneurs Finance Initiative (We-Fi)’, which aims to mobilize over $1 billion as finances for women entrepreneurs. In addition, through the ‘1000 Leaders’ initiative, the UAE will provide women with empowerment training and opportunity, honing their skills and capabilities to become leaders in various sectors of the economy. The foreign assistance projects supporting this cause include vocational training for women and supporting female entrepreneurs in low and middle-income countries. The UAE is supporting more than 100 projects in women and child health sectors and countries that have benefited including Afghanistan and Sri Lanka. In Afghanistan for example, the UAE supports the Saffron industry whereby women represent 80 percent of the production activities. On his part, Dr. Scott Richardson, the Executive Dean and Associate Professor of Emirates Academy of Hospitality Management said that hospitality industry plays an important role in the economic development of many countries and that he was optimistic that the training would benefit the Kenyan tourism sector.